This board game has been on my list to try ever since Mofo Rising briefly mentioned it some time ago. It's a game where you play an investigator who has to stop one of the Great Old Ones from destroying the world, and not get devoured or go insane in the process. Sounds like a fun game to me! Anyway, I finally purchased a copy. Now the hard part is finding a few people interested in playing a board game that will last 3 to 4 hours. I've heard a few good things about this from other friends. I'll have to check it out one day! Wow! People still play board games? I'd play for 3 or 4 hours, but I'd need a primer for Arkham Horror... I love LOVECRAFT though. The trick is finding other people who are nerdy enough to spend time playing it. It takes almost an hour just to set the game up. The actual game usually takes three or four hours to play, and even when you do that you usually lose. But "losing is fun!" Anyway, if you can find some friends who are willing to play, they "get it", you've got hours of enjoyment. If you can somehow get to a point where you can game the system and win, there are a ton of expansion packs which make the game more difficult. Whose the other guy who loves these games? Oh, the Burgomaster. If you're willing to spend the time, and can find some other people who are nerdy enough to love these games, there's a whole new world open to you. Arkham Horror is probably the sine qua non of these games. I can't wait for my kids to get older so I can play stuff like this with them! Right now we play board games, but the problem is that unless I keep them somewhere the kids don't know about pieces go missing. I can't tell you how many decks of Uno I've purchased, I've bought three boxes of battle ship, and I'm about to buy a second Stratego, plus various other games that I didn't feel the need to replace. Damn, now I want to see if I can find my Cthulhu RPG books. I haven't seen those in years. We have the same problem with games in our house: pieces tend to end up MIA. We've also been through multiple UNO decks. There are three games that are inviolate. Two are the wooden-boxed versions of Sorry and Scrabble, while the third is Mommy and Daddy's Yahtzee. Luckily for the kids' Yahtzee, what usually goes missing is a dice and we can easily replace those. My kids might be focuses and interested enough for Arkham Horror. They are younger (10,8,6), but the oldest two can stay quite focused for long periods for games and reading. 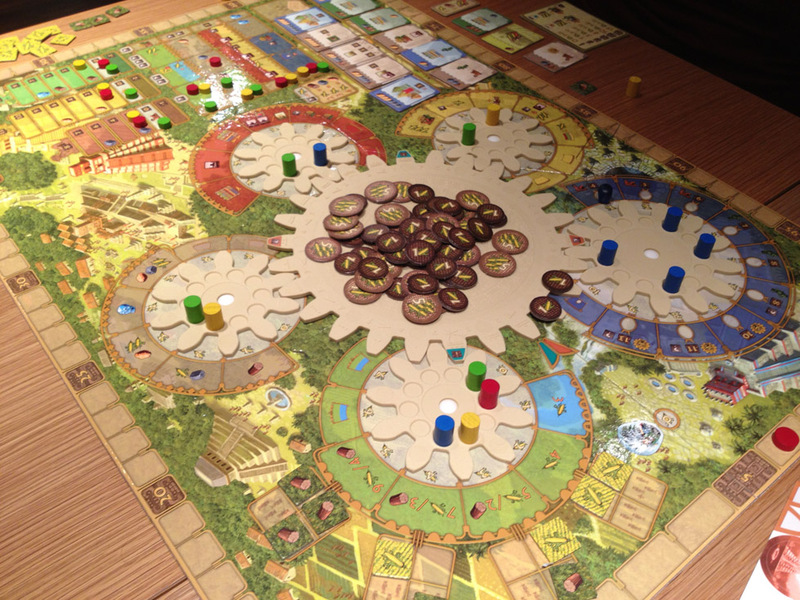 Plus, a cooperative game might lead to less strife than other, less cooperative board games. I'm looking at you, Monopoly: destroyer of worlds. Yup. I have ARKHAM HORROR. My boardgame collection is hovering around 300 right now. I visit the Board Game Geek website quite often and my games are all listed under my profile on that website. I really enjoy European strategy games, but I have a nice variety of other stuff, too. For awhile, my wife and I were playing games at least 4 or 5 days per week. We have cut down quite a bit, but we still play several times every month. For those of you who are familiar with games like CLUE, STRATEGO, MONOPOLY, and RISK, I assure you there is an entire universe of far superior games out there. They might cost you $30 - $75 apiece (or more), but they are worth it. I buy most of mine online from Cool Stuff Inc.
Another good cooperative board game is PANDEMIC. The players each assume a role as some sort of expert. Each role has a different special ability. The game is about outbreaks of 4 different diseases. The board is a map of the world and the experts travel from city to city trying to stop the outbreaks and cure all the diseases. The longer a disease exists in a city, the bigger the chance it will spread to other cities. So, the players are always trying to stop the diseases from spreading. If they are successful, they win (it is a cooperative victory). Otherwise, the world basically gets wiped out and everyone loses. DEFENDERS OF THE REALM is a sword-and-sorcery cooperative game. It is similar to PANDEMIC, except the players use D&D type characters to try to prevent different types of monsters from multiplying and taking control of the realm. Another cooperative game is FORBIDDEN ISLAND. 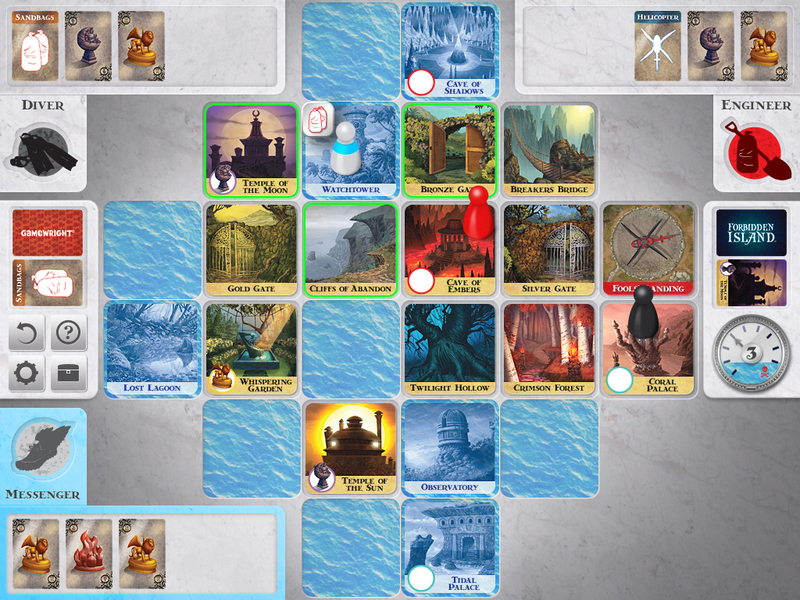 In this one, players are on an island that is sinking. The island is made up of square tiles and you remove the tiles from the board as parts of the island sink. This gives the players fewer and fewer spaces to maneuver their characters on. Eventually, there could be no place to go except into the ocean. 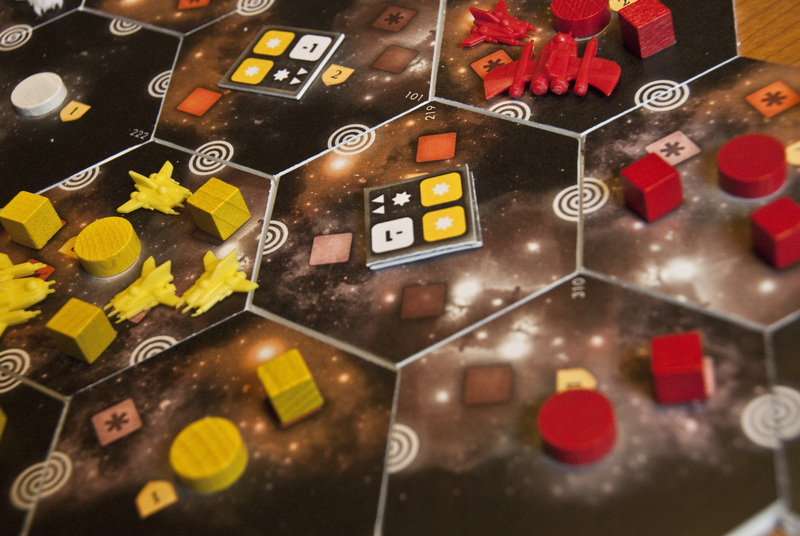 ECLIPSE is a good sci-fi game where you control a civilization in outer space and try to gain victory points by researching technologies and expanding your empire (peacefully or otherwise). 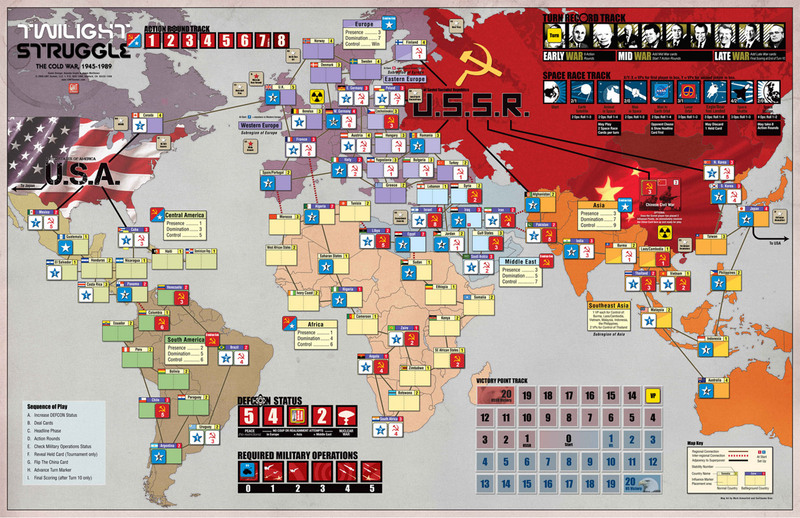 And if you are looking for a deep, historically based game, you might want to try TWILIGHT STRUGGLE. 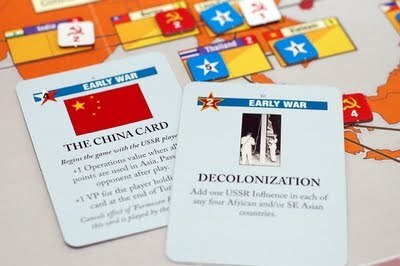 One player controls the U.S., the other player controls the U.S.S.R., and it's a Cold War battle to influence other countries to become your allies. Finished our 1st game and we did have fun. Even managed to win! It definitely lends itself to planning and cooperation. By the end of the game we had figured out that some people should concentrate on killing monsters, others shutting gates, and still a 3rd class providing support (buying items, searching for items). Andy and I ended up being monster killers, him being a bit tougher due to having a .45 and a magic blade. I had a serviceable rifle, along with lucking out on my skill letting me reroll failed combat checks. The rest mostly worked on closing gates. There is definitely some luck involved in getting useful items to the right people (or trading to make it happen). I ended up in the asylum once following a mass of fighting. I like that aspect of the game - the erosion of sanity. We did have bad luck at 1st, managing to put a dark young, a shoggoth, and a flying polyp on the board in short order. We ended up dealing with the polyp by closing its gate, because that thing is mean. I really want to get that game. The reviews I've read and the comments here just make it sound like a lot of fun, even if everyone playing dies! Plus it can be played as a single player game for those who are antisocial (although I guess it would help with learning the game). 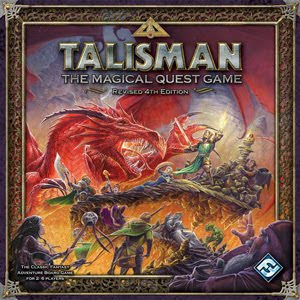 Not to stray too far from Arkham, I got Talisman for under $30 on clearance at Barnes & Noble recently. Can't decide if I should resell it or just get some people to play the darn thing. Anyone else played it before? We're having fun with it. The kids asked us to start a another game, which we did. So far everything is going wrong. Nearly all of our skills and items started out mismatched, gates keep opening on top of each other and causing monster surges, and we keep drawing powerful monsters from the monster cup. I am again, more of a monster hunter character but have only been able to obtain a calvary saber for a weapon. I was able to clear a critical street intersection of the 3 monsters blocking it, but then was promptly jumped by three flying monsters that sent me screaming to the asylum. Our best fighter ran into a monster that he could have beaten in combat, but it was so terrifying that he automatically failed his horror check, lost all his sanity, and joined me at the asylum. We currently are in a position to seal one of four gates, but the investigator there needs to pass an evade check vs a Gug before attempting to seal the gate. If she fails, the Gug is going to maul her and send her to the hospital. We are getting our butts kicked! We all also need to stop drawing "A horrible monster appears!" encounter cards. 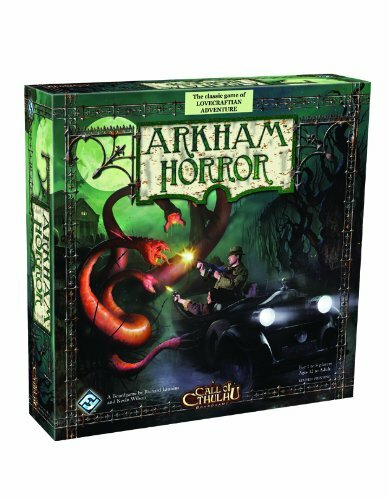 We love Arkham horror, have played it a couple of years. it is immensely complex, and it takes some real practice to play it right and by the rules. The maxim that "if in doubt, the ruling that is adverse for the players is the correct ruling" is the way to do it. My wife and I usually play two investigators each, and we choose which Old One it will be depending on our mood. It takes quite a while just to shuffle the decks and to set it all up, but it's worth it! There are apps available for iOS that will do the card draws for you, but I can't quite get over just using the physical cards, myself. The expansions add quite a variety to the game, and playing with multiple expansions in place makes the game even harder to play with good pace and accuracy to the rules. If you consider the expansions at all, I'd be glad to comment on what I made of them. I would love to hear about the expansions. We are already considering Innsmouth and Dunwich. Another rainy day here, so we finished the game. Actually managed to pull it out and win by a lot of cooperation. Planning out the turn at the start of upkeep is critical. I became a sacrificial lamb one turn, but went down swinging after taking out 4 out of 5 monsters that were blocking the street we needed cleared. Arkham Horror is awesome. I got it last year and have had a great time playing with my friends. However, it seems to me that the optimum number of people to play with is probably 4. Speaking of which, how do the expansions stack up? I was considering getting Innsmouth Horror, mainly because I loved Shadow Over Innsmouth. Killing fishmen seems like a good time.